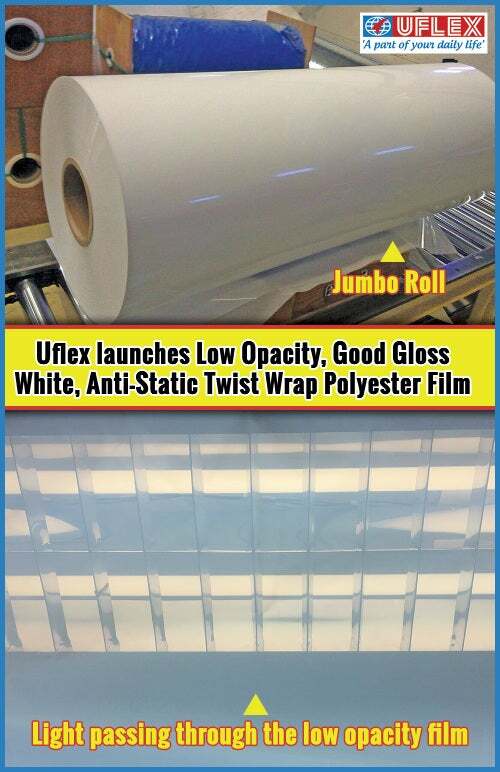 With this problem statement at hand the Films Business of India’s largest multinational flexible packaging materials and Solutions Company Uflex Limited has engineered Low-Opacity, Good Gloss White Anti-static Twist Wrap Polyester Film FLEXPETTM F-WTG-AS. This bi-axially oriented polyethylene terephthalate (BOPET) Film as the name suggests is low-opaque/ translucent and has good gloss. Talking about this new film Mr JK Sharma, DGM Technical Service and New Product Development (Films) at Uflex, said: "Convertors catering to candy /confectionery brands had been asking for a white glossy substrate with low-opacity for imparting superior aesthetics to their packaging. The daunting challenge however was that, if you make a white opaque film the gloss quotient goes down. Owing to our special proprietary resin formulation we have been able to engineer a white background film which is translucent (less opaque) and offers high-gloss too. "It is for our special FDA approved food compliant antistatic coating recipe that the film exhibits excellent machinability on printing and twist wrap machines. The film can be surface printed or can be metalised for that matter as per the requirements of the buyer. The unprinted substrate by itself can also be readily used by the brands to twist wrap their candies/ confectioneries." Explaining more about the new film, Mr Pramod Sirsamkar, president of technical and new product development (films) at Uflex Limited, said: "Besides having superior handling and high mechanical properties the film has a zero memory (i.e. excellent twist retention) and is eco-friendly. Since the density of the new substrate is lesser as compared to the conventional white twist wrap film, its yield is more. Further since the Low-Opacity, Good Gloss White Anti-Static Twist Wrap Polyester Film is a monolayer structure it can be easily recycled thereby contributing to the circular economy. "There is a promising demand for this new film in the European and CIS Countries and is gradually picking up in other continents too. Here one must note that the conventional white twist wrap film in its own right also has a great demand. It will be incorrect to say that the new film is a replacement of the conventional white twist wrap film. Both the films have well defined mutually exclusive markets. We formulated this film at our manufacturing plant in Dubai and can manufacture it at any of our locations." Speaking about the newly launched substrate, Mr Ashok Chaturvedi, chairman and managing director Uflex Limited, said: "With incessant R&D supported by the most contemporary and cutting-edge technology, my engineers never ever fail to delight our clients by addressing their pain points with the most optimised and sustainable packaging solutions. Low-Opacity, Good Gloss White Anti-Static Twist Wrap Polyester Film adds a whole new dimension to candy/confectionery packaging."